I plant a lot of flowers every summer for my container garden. 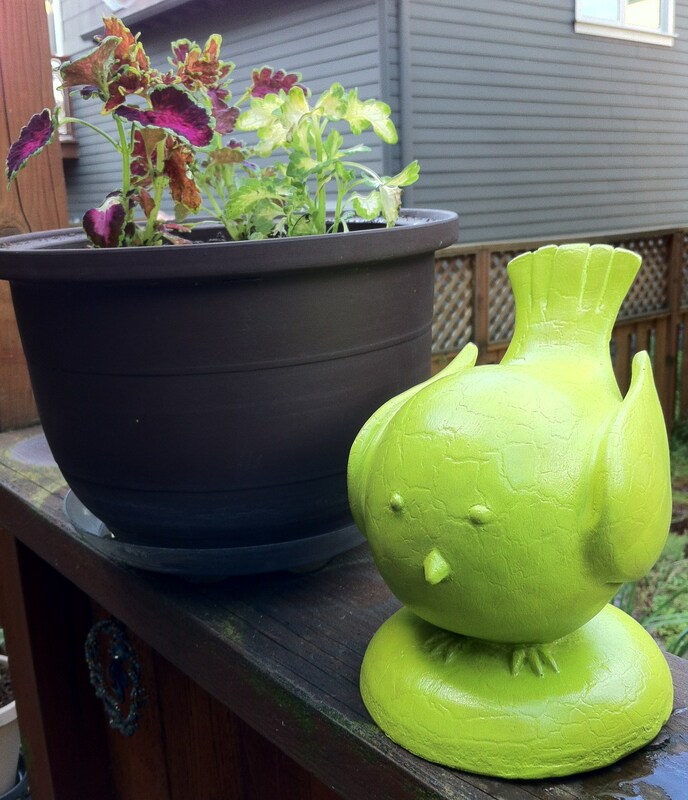 Years ago I purchased this resin bird statue to sit among my flowers. I leave this bird on my back patio all year round and the sun and rain end up fading it. Every other summer I repaint it and give it a couple coats of spray varnish. I’m pretty sure this statue will last forever! Well, this year I’ve been seeing all kinds of amazing bright green and orange flower pots. 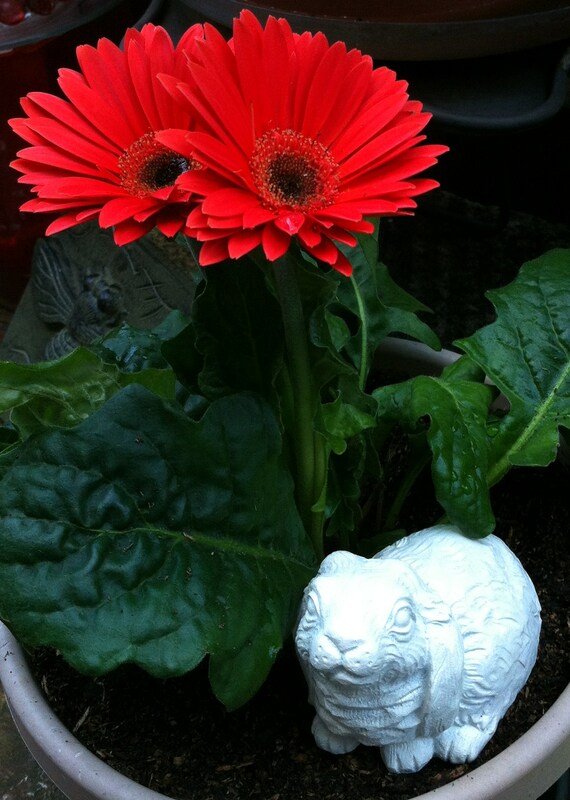 Because I already have more than enough flower pots, I decided to bring in a bit of new color with paint. Since my red bird was looking less than red, I figured it was time to try green! I gave it a good scrub with soapy water and let it dry. I used some acrylic paint I had already, the color is called Citron Green. I didn’t bother with a base coat of primer or anything, so I had to do about three coats of green to get a good even finish. Once that was dry I sprayed it with the clear to help it last longer in the rain and sun. I really love this color! I put the bird next to my Coleus plants. The way the leaves match the birds green color is great, and the purple and pinks make it pop even more. 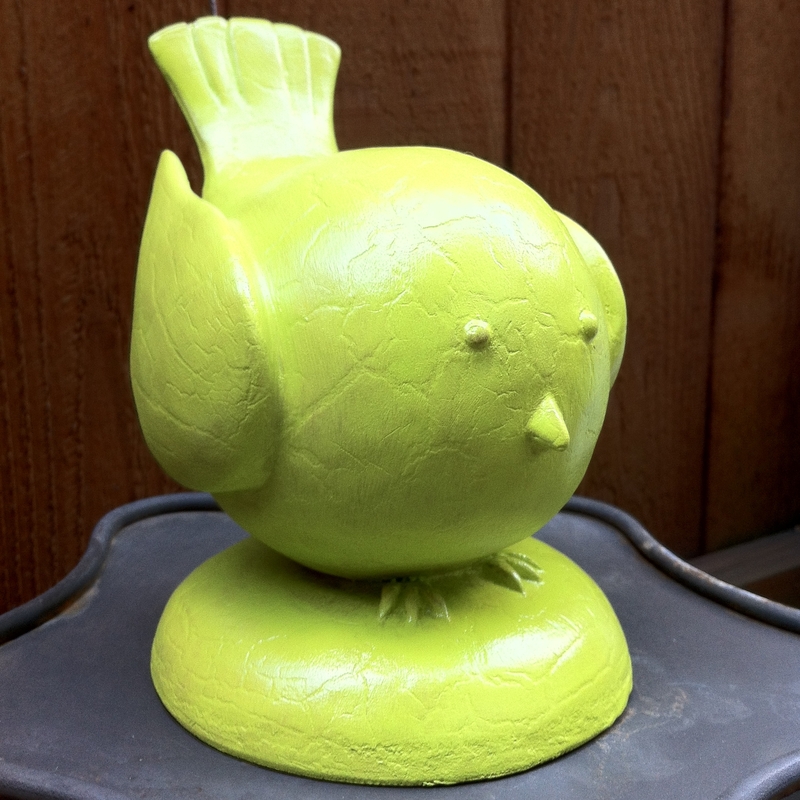 After seeing how bright and modern my bird was looking, I decided to repaint a small bunny statue I had. This little guy came from the Dollar Tree. 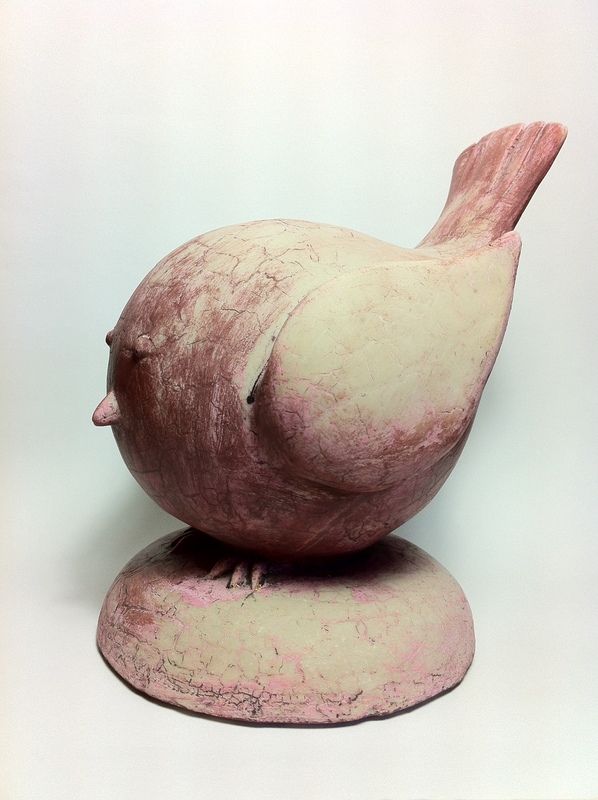 Like the bird, it’s resin and will last for a very long time, it just started looking kind of faded and not as cute. An easy fix, white paint! I’ve loved seeing all of the things people paint white these days, from thrift store statues to ugly lamps. A solid white object looks really modern and cool. I scrubbed the bunny with soapy water and let it dry. I used white acrylic paint and gave it a spray of clear varnish as well. 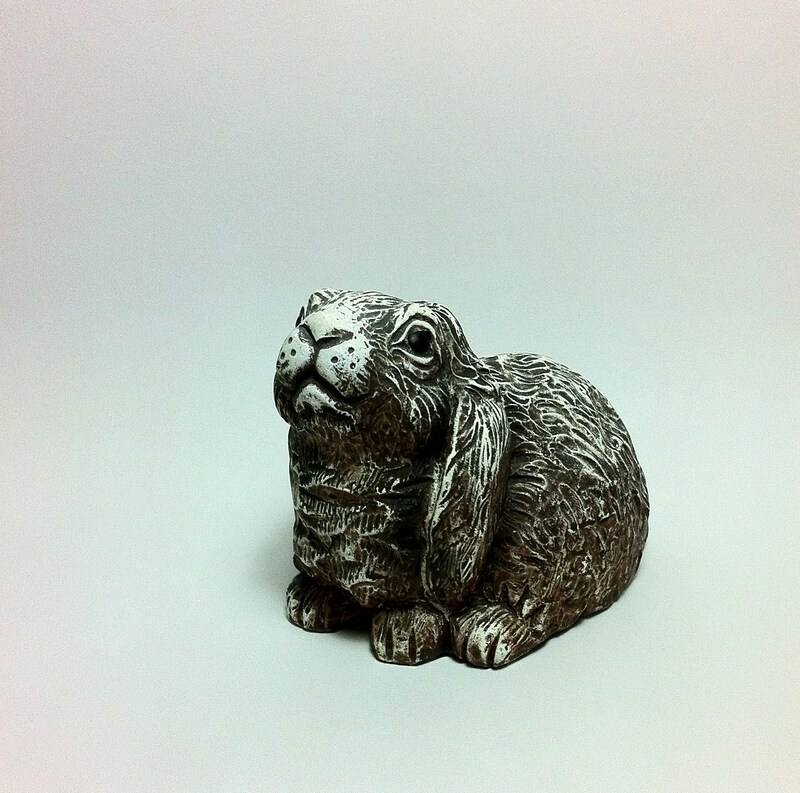 This little bunny fits in the palm of your hand, and fits neatly on top of a flower pot. I love the contrast with bright flowers and leaves. Next year I think I’ll repaint a few more garden statues and maybe even some of my flower pots. This was a free project because I already had the paints on hand. A little more than an hour, quicker if you use spray paint, and you get a whole new look! It’s summer time, that usually means making time for something fun! Whether you are out of school or just have a day off work, you might be looking for an activity to do with friends or family. Awhile ago I posted about DIY ceramic painting, which is a great option. Today I want to share my experiences with DIY glass art. My first class was purchased from Groupon. 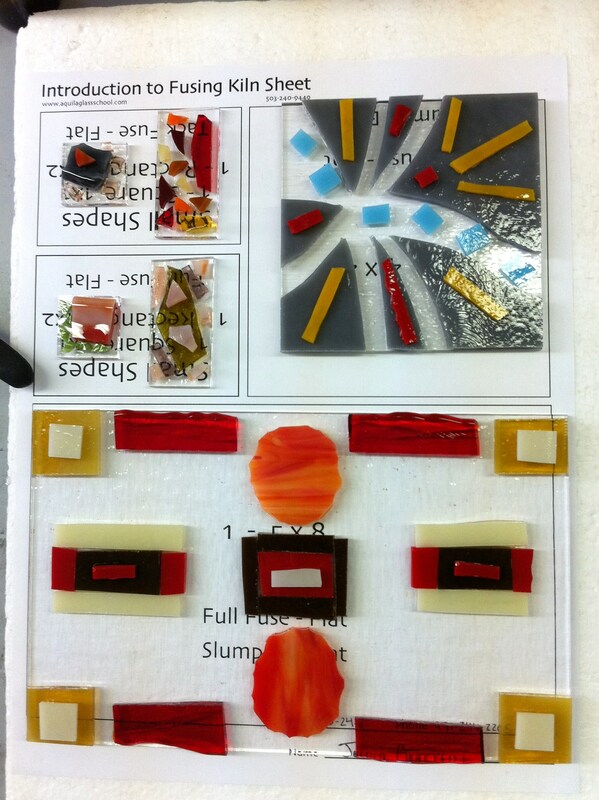 This was for “Intro to Fusing” which was offered by Aquila Glass School here in Portland, OR. This class was a lot of fun and we got to make several pieces to take home. Fusing glass is a process where you cut and layer glass pieces that will be “fused” together in a kiln. This process is easy to learn and allows for a lot of creativity. You will end up with amazing art glass. I took this picture at the end of the class. 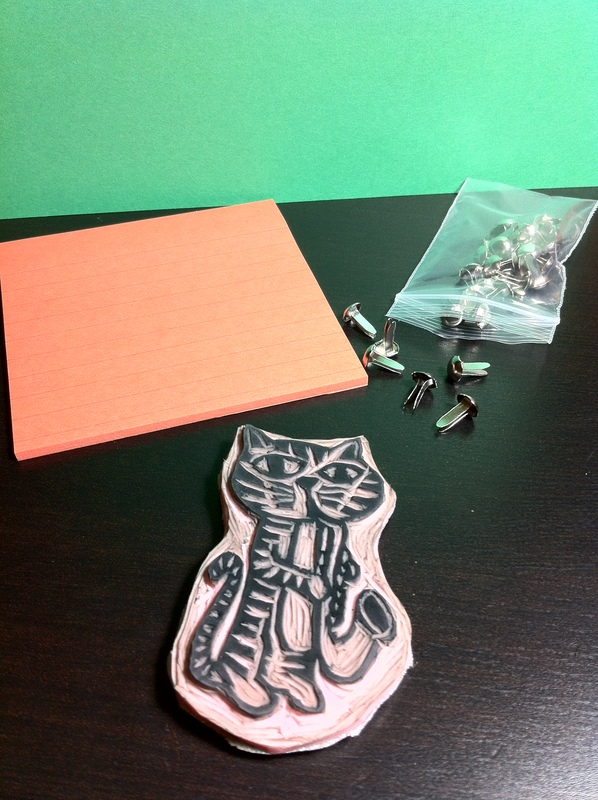 Here you can see the items I’ve made before they enter the kiln. In this class, we learn how to use the tools to break and cut our glass, we learn how to assemble our pieces and get them ready for firing. We each made four pendants. The two on the left are fired until they are “tack fused” meaning they are stuck together but the edges are still defined and you will feel the separate layers. The two on the right are “full fused” meaning that the glass is heated to the point where the layers melt down into one, these are smooth to the touch. 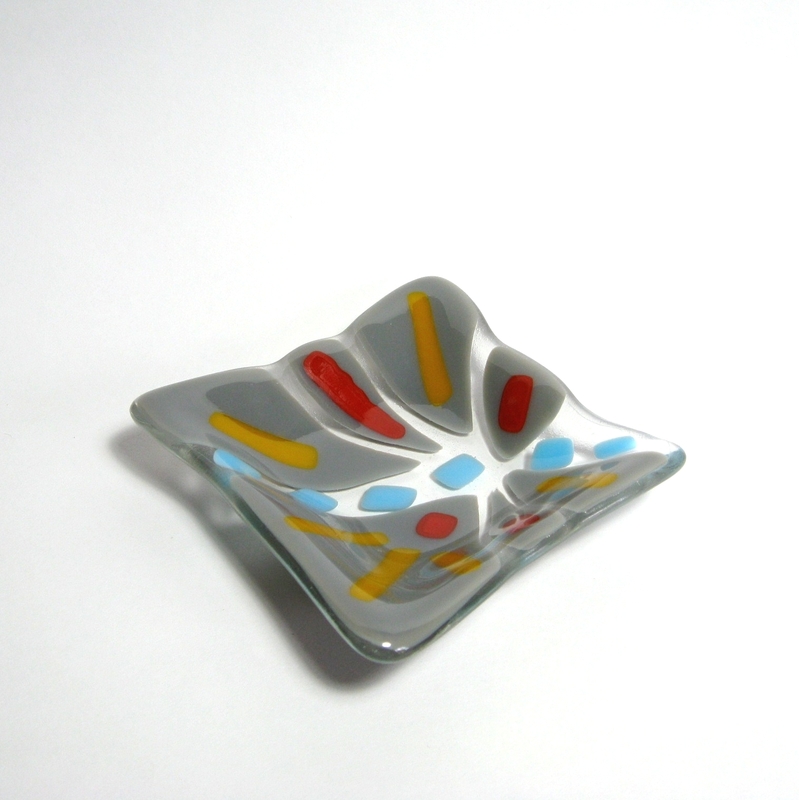 The biggest piece we made was a 5″x8″ glass tray. These start out with a clear 5″x8″ sheet of glass. You get to pick out your colors, which if you notice the orange circles on my tray, can include patterned glass. We cut our glass to the sizes and shapes we wanted and they layered them onto the clear glass base. 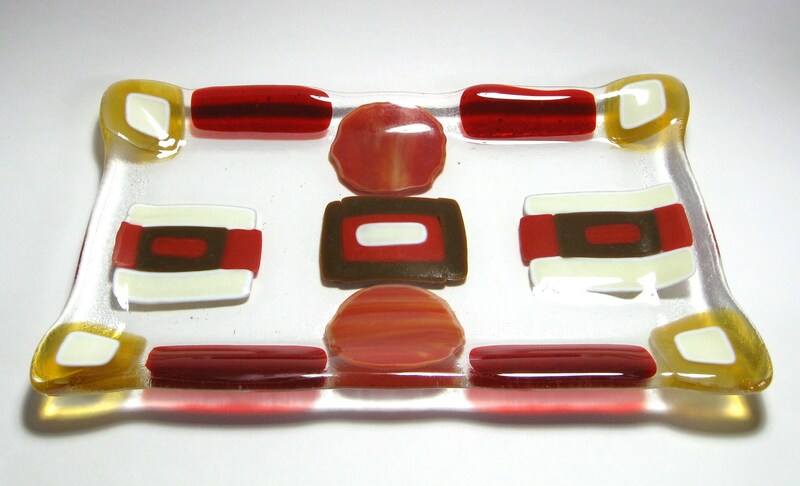 I used an opaque brown and cream colored glass as well as the translucent red and yellow. If you stack the pieces just over the edge of the clear base you can get a sort of scalloped look like mine, or make them line up for a straight edge. These pieces are fully fused into one smooth layer. To get the shape of a tray, they are fired a second time, this is called slumped glass. The piece is placed over a mold and heated, the glass will become hot and drape itself over the mold, taking that shape. The last piece is a 4″x4″ bowl. This was fun to make because we all had to use the same basic technique. The base is a clear sheet of glass. We were given a 3″x3″ square of opaque gray glass which we wrapped in a towel and broke with a hammer. Once you had your gray shards of glass you would lay them back into a square on top of the clear glass. By lining up the gray edges with the clear edge you get a neat cracked look. Then it was up to us to embellish it and make it unique. I chose all opaque glass in red, yellow, and blue. This piece was also slumped to get the bowl shape. Glass fusing is really fun to learn and produces satisfying results in a short time. A few hours of class and a couple days for firing later, I got to pick up my finished art. 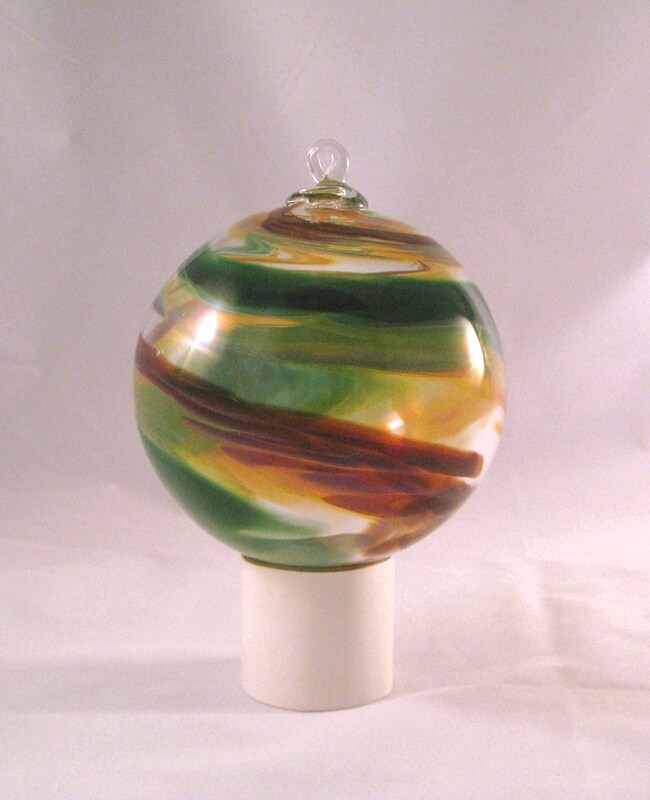 The coolest part is that once you take this class, Aquila glass will let you use their studio to create on your own! 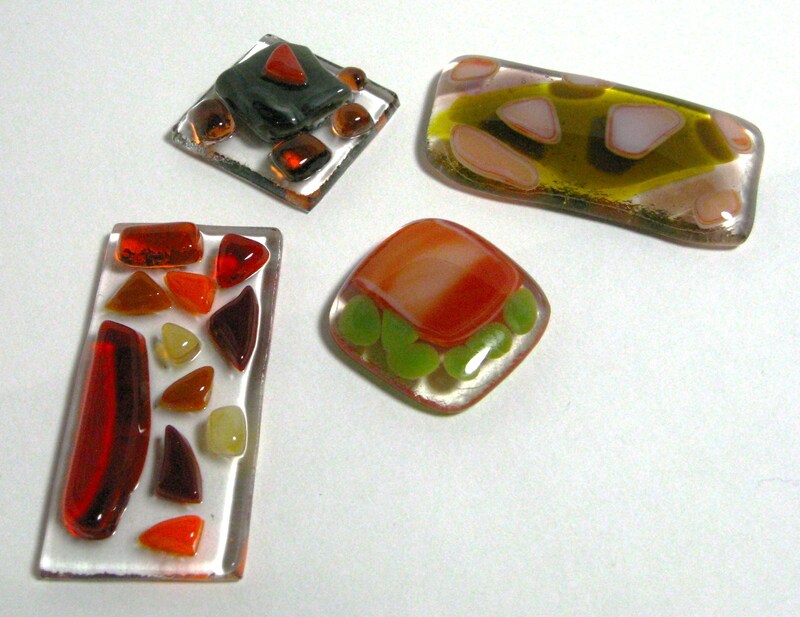 The staff are very knowledgeable and helpful, so I wouldn’t feel intimidated to give glass fusing a try again. 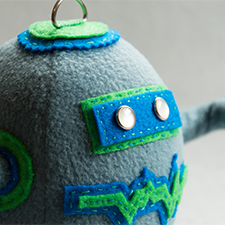 This is one of those projects that can be as simple or as complicated as you want. 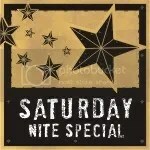 These items also make pretty home decor, if you’re willing to part with your creation, they would be lovely gifts as well. Let me know if you take this class and feel free to share a picture on the Created by Jess Facebook page! My second adventure with glass was a glass blowing class that I purchased through Living Social. 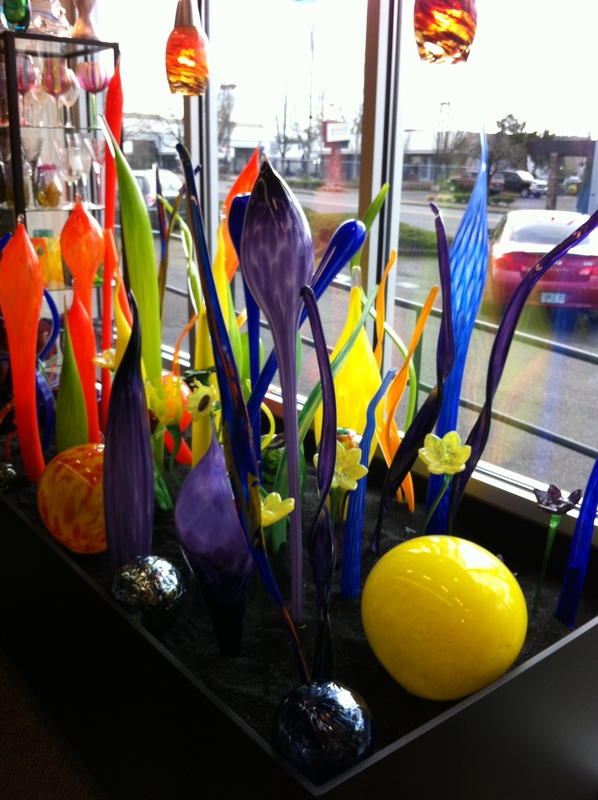 This was “Blow your own glass masterpiece, level 1” at Live Laugh Love Glass in Tigard, OR. This place is amazing! The studio and all other areas are incredibly clean and comfortable. I went with my sister, grandma, and aunt. We had a great time and it was only the four of us in the studio! Our instructor, Jeff, was a very nice guy and really helped us to learn the process so that we could make our own pieces with him observing. It was very rewarding picking up the finished piece and knowing that with only a few steps done by Jeff, we had made the rest. The Hot Shop is bright and very warm, while this could be a dangerous place, you don’t have to worry because safety is a priority and you will be in good hands. This start to finish class covers materials, techniques, equipment, safety, and fun. We watched Jeff do each step and then tried it ourselves. One at a time we went through the whole process until our piece was finished. I really liked this one on one attention and felt confident going through each step on my own, knowing the instructor was supervising and could help out if you started to get nervous or had a hard time with anything. You can stay and watch from the Hot Shop as your friends make their piece, or you can observe through the large glass wall from the comfort of the air conditioned room with cozy seating and beverages. You get to pick your colors from a really large selection, and Jeff was really patient explaining how some look totally different when you heat them up, or others are clear or opaque. I made a large glass float and had Jeff put a loop of glass on it so that I can hang it up. I chose green, brown and yellow to match some other colors in my living room, in case I wanted to hang in inside. These look so pretty outdoors with the light shining through them though, I think it’s going to be garden art! The finished pieces are really strong. There are a few choices to make in your first class, and I’m sure you’ll find the right colors for you, have fun! 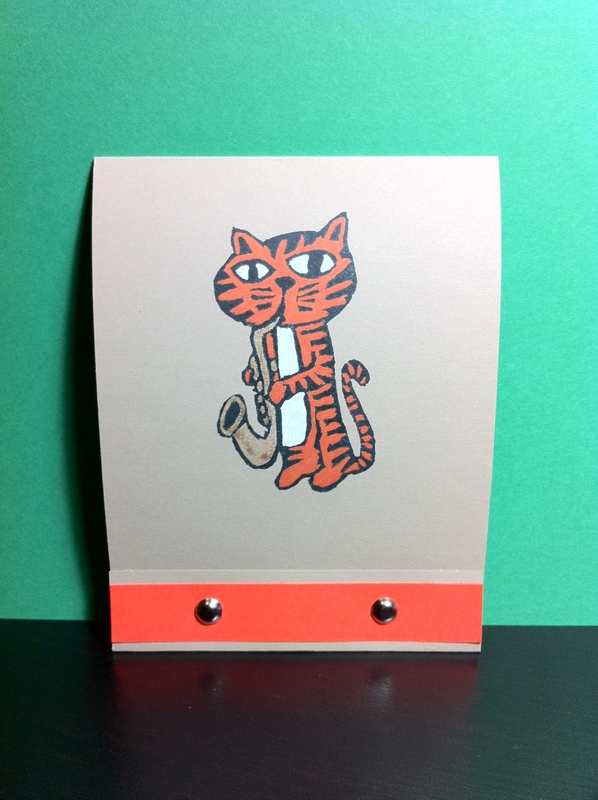 These little notepads are fun and easy to make. You need a few supplies that you probably don’t have on hand. 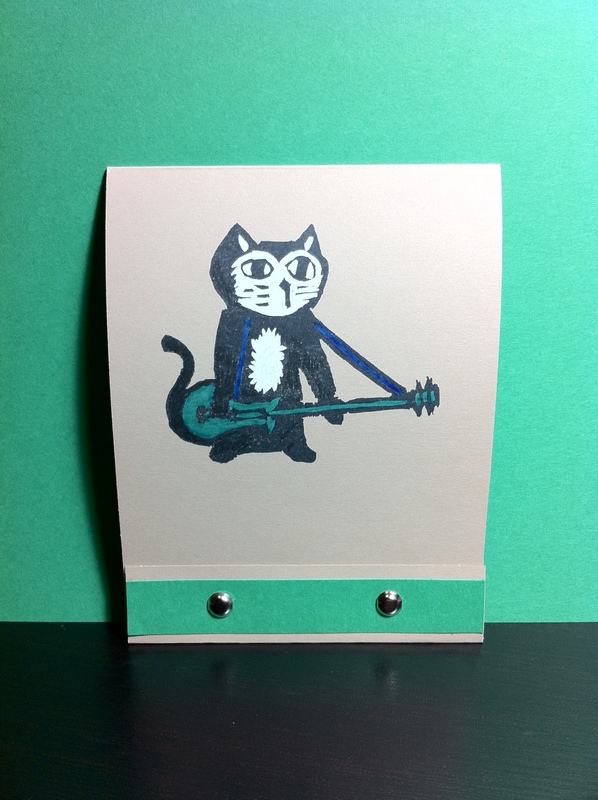 I’m using folding cards from Paper-Source. 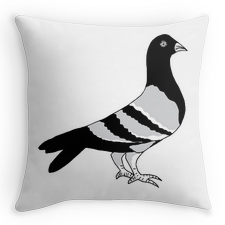 I bought mine in the store, online they seem to only offer a silver color. 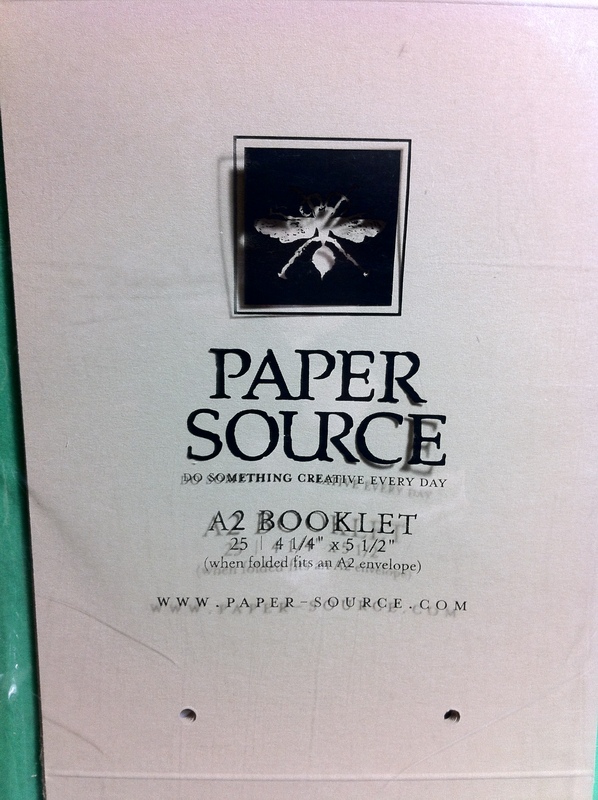 I’m sure you could find something similar to use, or make your own from thicker cardstock. The other main thing you will need is large Post-it notes. 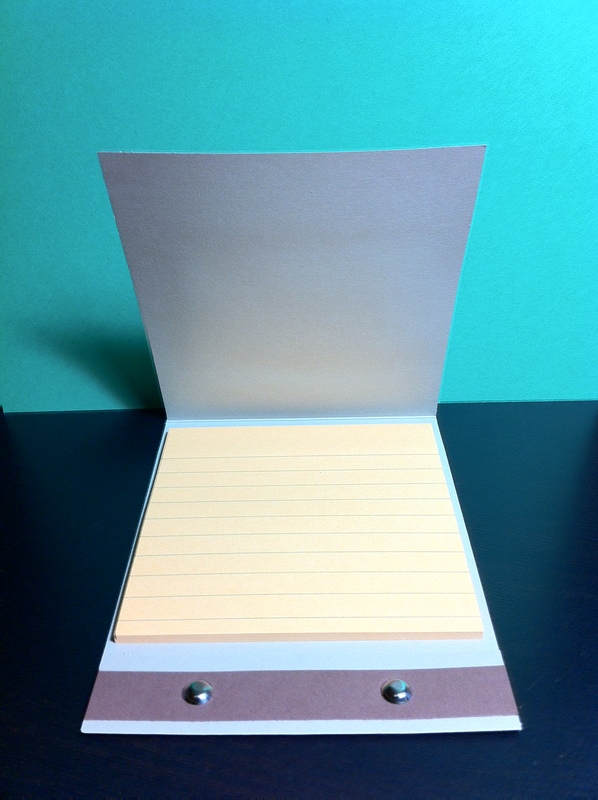 I’ve use recycled super sticky Post-it’s for my notebooks. 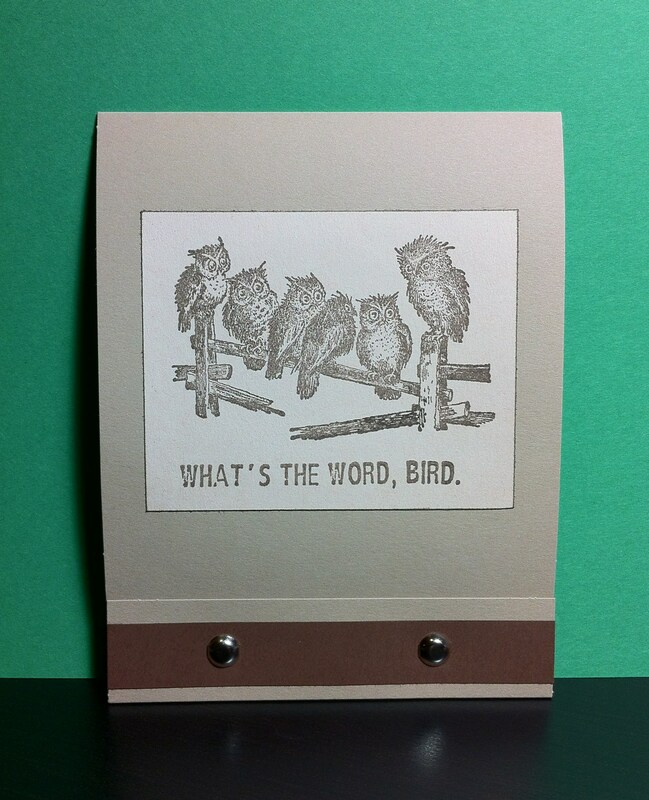 Now you just need some colored paper, brads, a glue stick, and your rubber stamps. The first thing you should do is measure a piece of paper for your front cover. 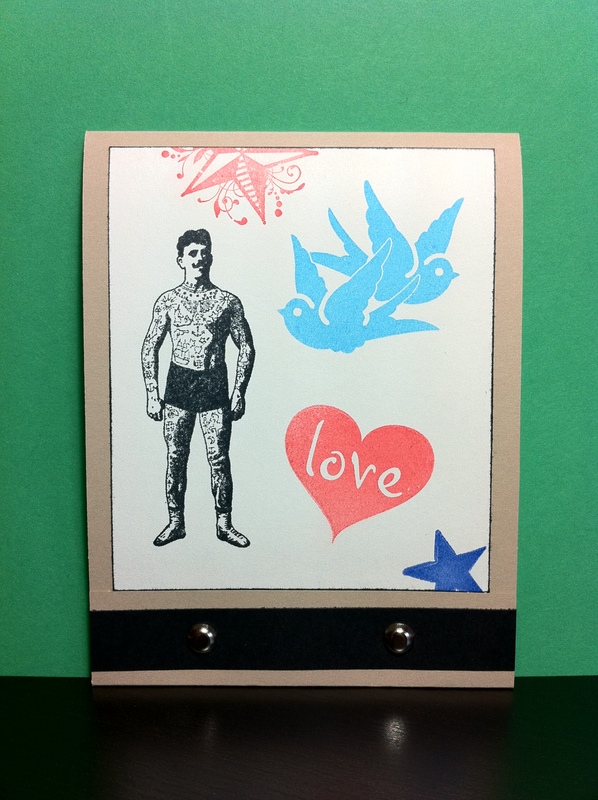 I prefer to stamp onto a piece of paper rather than directly onto the cover. In addition to that larger piece, you will need to cut two strips of paper, either the same color or a complementary color to your design. These strips of paper will go across the bottom, on the front and back. The front strip gets glued down before you insert the brads, and the back strip will be glued on to cover up the brads on the backside. The brads are used to keep the bottom edge together which allows you to keep the cover closed, like a matchbook. Once you have your design stamped, you can glue that to the cover. 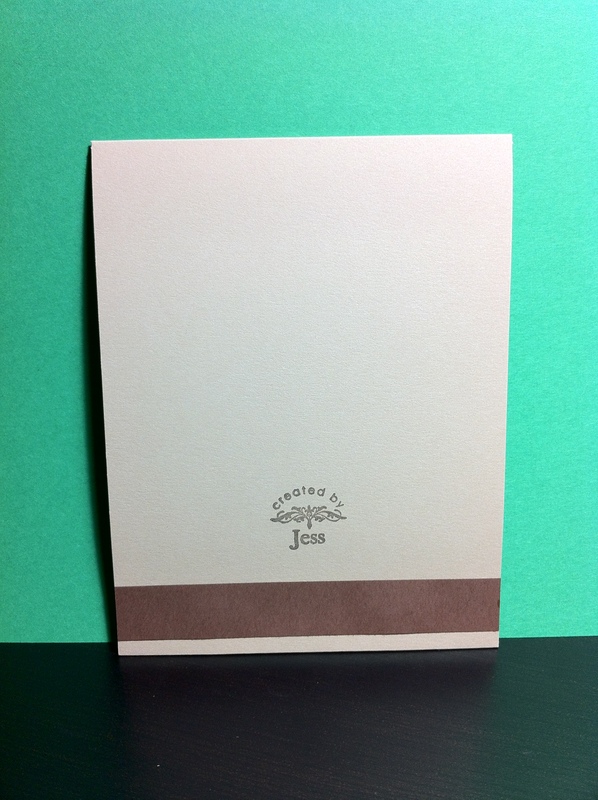 I’ve added my Created by Jess stamp to the back of my notebooks. To make these re-usable, I’ve chosen to fill them with super sticky Post-it notes. I divided each post it note pad into three sections. That gives about thirty notes per book, anymore and it would be too thick to close the cover. The great part is, the Post-it’s won’t leave a messy residue, when you run out, just stick some more inside!